I’m a firm believer that any environment which facilitates the learning of children and young people with special educational needs and disability (SEND) needs to be conducive for all. In the last #senco5aday blog, I focused on people and leadership. In this piece, I take a closer look at ‘place’ and how we take ‘notice’. For any practitioner working with children, the assessment tool of observation is vital. I have spoken elsewhere about the logistics of observation in relation to SEND. Undertaking observations, particularly of children, to understand behaviours and see patterns requires an intense sense of presence. Most of us spend time thinking about the past, often with feelings of guilt or thoughts of ‘if only …’ We also invest time worrying and fearful of the future and unknowns ‘what if …’. We cannot change the past. Worrying about the future won’t change it, either. In fact, both these emotions drain us. Far better to be in the ‘present’, fully aware of things around us, noticing change and newness and acknowledging what works – gratitude and trust. Take a moment to celebrate all the things you have achieved this academic year. Years ago, I read the book, “The Monk who sold his Ferrari” by Robin Sharma. In it, Robin shares the following fictional story, that brings a real-life twist to the forefront. I certainly spent some of my teens wanting to be older and part of my adult life, wanting to be younger! Peter was a young boy who could never live in the moment. When he was in school, he dreamed of being outside playing. When he was outside playing, he dreamed of his summer vacation. Peter constantly daydreamed, never taking the time to savour the special moments that filled his days. One morning, Peter was out walking in a forest near his home. Feeling tired, he decided to rest on a patch of grass and eventually dozed off. After only a few minutes of deep sleep, he heard someone calling his name. “Peter! Peter!” came the shrill voice from above. As he slowly opened his eyes, he was startled to see a striking woman standing above him. She must have been over a hundred years old and her snow-white hair dangled well below her shoulders like a matted blanket of wool. In this woman’s wrinkled hand was a magical little ball with a hole in the centre and out of the hole dangled a long, golden thread. “Peter,” she said, “this is the thread of your life. If you pull the thread just a bit, an hour will pass in seconds. If you pull harder, whole days will pass in minutes. And if you pull with all your might, months – even years – will pass by in days.” Peter was very excited by this new discovery. “I’d like to have it if I may?” he asked. The elderly woman quickly reached down and gave the ball with the magic thread to the young boy. The next day, Peter was sitting in the classroom feeling restless and bored. Suddenly, he remembered his new toy. As he pulled a little bit of the golden thread, he quickly found himself playing in his garden. Realising the power of the magic thread, Peter soon grew tired of being a schoolboy and longed to be a teenager, with all the excitement that phase of life would bring. So again, he held the ball and pulled hard on the golden thread. Suddenly, he was a teenager with a very pretty girlfriend named Elise. But Peter still wasn’t content. He had never learned to enjoy the moment and to explore the simple wonders of every stage of his life. Instead, he dreamed of being an adult, so again he pulled hard on the thread and many years flew by in an instant. Now he found that he was transformed into a middle-aged adult. Elise was now his wife and Peter was surrounded by a houseful of kids. But Peter noticed something else. His once jet-black hair had started to turn grey and his once youthful mother, whom he loved so dearly had grown old and frail. Yet Peter still could not live in the moment. He had never learned to live in the now, so once again, he pulled on the magic thread and waited for the changes to appear. Peter now found that he was a ninety-year-old man. His thick dark hair had turned white as snow and his beautiful young wife, Elise, had also grown old and had passed away a few years earlier. His wonderful children had grown up and left home to lead lives of their own. For the first time in his entire life, Peter realised that he had not taken the time to embrace the wonders of living. He had never gone fishing with his kids or taken a moonlight stroll with Elise. He had never planted a garden or read those wonderful books his mother had loved to read. Instead, he had hurried through life, never resting to see all that was good along the way. Peter became very sad at this discovery. He decided to go out to the forest where he used to walk as a boy to clear his head and warm his spirit. As he entered the forest, he noticed that the little saplings of his childhood had grown into mighty oaks. The forest itself had matured into a paradise of nature. He laid down on a small patch of grass and fell into a deep slumber. After only a minute, he heard someone calling out to him. “Peter! Peter!” cried the voice. He looked up in astonishment to see that it was none other than the old woman who had given him the ball with the magic golden thread many years earlier. “How have you enjoyed my special gift?” she asked. “I’d like to go back to being a schoolboy and live my life over again,” Peter quickly responded. He then returned to his deep sleep. Again, he heard someone calling his name and opened his eyes. “Who could it be this time?” he wondered. When he opened his eyes, he was absolutely delighted to see his mother standing over his bedside. She looked young, healthy and radiant. Peter realised that the strange woman from the forest had indeed granted his wish and he had returned to his former life. “Hurry up, Peter. You sleep too much. Your dreams will make you late for school if you don’t get up right this minute,” his mother admonished. Needless to say, Peter dashed out of bed and began to live the way he had hoped. He went on to live a full life, one rich with many delights, joys and triumphs, but it all started when he stopped sacrificing the present for the future and began to live in the moment. Focusing on the future (or event past), are we letting time pass by that we forget to live the moment? In doing so, are we missing out on the ‘Joy of Learning‘ children are experiencing now? How can we shift our gaze from the golden thread to The Golden Circle advocated by Simon Sinek? Over the next few days, make an intentional effort, for whatever time you can to walk around your learning environment. Focus not on thoughts of the past (what should or could have been done) or even on the future (I need to do this or talk to). Focus on the NOW. Just BE. What taste is on your tongue? What textures can you feel against your skin? Can you feel / hear yourself breathing? Is there anything you notice that is new or different? How can you authentically compliment colleagues on the learning environment they have created for their learners? Remember, being is lost in becoming! SENCO: It’s all about People! In the last #senco5aday Blog Abigail Hawkins and I shared a framework for considering SENCO wellbeing on a day-to-day basis. We chalked the evolving journey from the ‘5 a day’ approach to a pragmatic 3Ps: People, Place & Purpose. In this blog, I begin to unravel further the focus on people. #TeamSEND in any setting is the largest team. It includes everyone from children, parents, staff, leadership, governance, external specialists and local area practitioners. Everyone has a role to play and a responsibility. Too often the SENCO is at the heart of co-ordinating different people on #TeamSEND, so that children, young people & their families can receive the support they need. This raises the question, what are the interpersonal skills SENCOs need to ensure effective people management? Broadly speaking, interpersonal skills involve the set of abilities that enable a person to interact positively and work effectively with others. There are various ways of sub-grouping interpersonal skills (Klein et al., 2006). However, these distil into three main subsets; the ability to motivate, communicate and build teams. There is variance across England, as to whether SENCOs are positioned as middle management or in a senior leader role. Khan & Ahmad (2012) researched the three attributes of interpersonal skills in relation to different levels of leadership. Whilst their sample was relatively small, they conclude there isn’t a prevalence of any of the skills at different levels of leadership. They are required at all levels. However, they also state a need for top level managers and leaders to invest in building teams. For the purposes of this blog, I assume SENCOs need all three skills of motivating others, communicating and building teams in equal measure, placing though a greater emphasis on ‘team-building’, due to the proportionate size of the team. It is also helpful, I believe to see these three skills, as interdependent, not separate. A few years back, a new senior leader arrived at an educational organisation I was working at. This leader made a choice to visit every faculty and deliver his vision speech. He then took questions. At one level, I appreciated his clarity and putting people at ease about his vision. However, when asked a question about communication, he brushed it aside saying, “Communication, we can always improve on communication”. I remember thinking, ‘What a missed opportunity?’ This was moment to listen. In that one response, he communicated his leadership approach, much more than he realised. It took a long time for colleagues to believe this leader was a listener. I am naturally curious, so I ask a lot of questions. Over time, though I’ve come to realise not everyone likes being asked questions. That said, I have found asking open-ended questions does give the team freedom to express their views. I guess it is also about timing, context and perceived depth of relationship. How much better would the world be, if we made time to encourage each other. I do not think encouragement is about ignoring issues we need to change but celebrating what’s working to sprinboard us further than we could imagine. Success breeds success. The first step of a new or unfamiliar task is often the hardest. Talking or walking people through this first step is great way to motivate them onto the next step and beyond. Think about how computer games are programmed. The first task is deliberately made easy to engage further participation. Why should working in teams be any different? I’m a great advocate of Appreciative Inquiry, as a theory of change. Two reasons; firstly, the positive core supports step 3 above. My second reason is part of the process enables others to dream. Not just dream, but dream BIG (open questions) and then find ways to make it happen. Giving people space to dream is both empowering and enabling. We do this a lot in our family. We have found it is a great way of acknowledging each other and where we are at, without over stepping boundaries and making assumptions. It’s about more than respect or support. It’s about honouring and giving people space to grow in a collective environment made of opposites. Over the years, I’ve met a few leaders who say the right things, but never follow through. In the words of J.F. Kennedy, “Once is an accident, twice is a co-incidence and three times is a habit”. When leaders don’t follow through, they lose respect and trust. Authencity matters, if we want the team to give their best. The SENCO role involves a phenomenal amount of communication, verbal and written. I would argue the amount of information received from others far outweighs the amount of information they give out. If you think differently, do let me know. I’d love to hear your views. Avoiding the concerns of others. Focusing on learning conversations and ‘managing difficult conversations’ is vital. This NCTL resource on Fierce Conversations is a good starting point to consider how to carry out unpleasant tasks. Training SENCOs at various points in their career development, I regularly talk to them about how they build teams and use leadership language that promotes greater team identity. Schools where this is emerging or embedded as an integral part of the school ethos, SENCOs are seeing a significant shift in the quality of teaching and provision in the classroom. SEND becomes a team responsibility. A team needs clear values and a purpose. For me, Section 19 of the Children & Families Act 2014 defines the values and purpose of #TeamSEND. Self-aware leadership, good relationships and clear roles and responsibilities are the foundation of successful teams. The role of the SENCO is often described as ‘isolated’, as within the setting they are the only one leading in this area. As such, it become imperative for SENCOs to think about self-leadership. In other words, how do you invest time in motivating yourself, communicating with yourself and intently seeking support from the wider team. I’d love to hear your thoughts on self-leadership. … till next time! Stay focussed and keeping connecting. The SENCO role, it’s all about people. Khan, A & Ahmad, W. (2012). Leader’s interpersonal skills and its effectiveness at different levels of management. Pupils … who are keen to progress but face genuine barriers or difficulties. And that’s just in school! Beyond the classroom SENCOs are individuals with families and a personal life, which have their own challenges and stresses to manage. In 2014, The New Economics Foundation published research that suggested there were five things an individual need to do daily to enhance and sustain their wellbeing. These are connecting with others, noticing something new, being active, giving or yourself and time and finally making an intentional effort to learn new things. This ‘5 a day’ construct led to the #teacher5aday movement alongside other more generic titles for other professions. In 2017, #senco5aday was launched. SENCOs need to take heed of some of the suggestions, but rather than trying to focus on 5 things to do each day, #TeamADL have grouped these into three easy to remember focus areas: People, Place and Purpose. We look forward to asking SENCOs, if they have P’d three times today! We’re pretty sure a blog will follow with their responses. 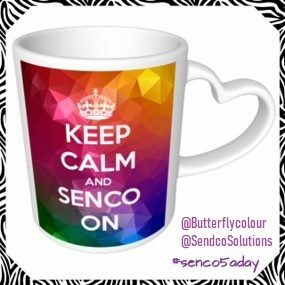 Our next blog will be in November 2018 and we will be focussing on People … till then use the grid below to record your thoughts on the 3Ps of SENCO wellbeing. What do you currently do to support your wellbeing?